HTC has announced three new fashion-centric smartphones in its Desire series called as HTC Desire 530, Desire 630 and Desire 825 at the ongoing MWC 2016 event in Barcelona. All the smartphones come with a unique design with dotted pattern back panel. 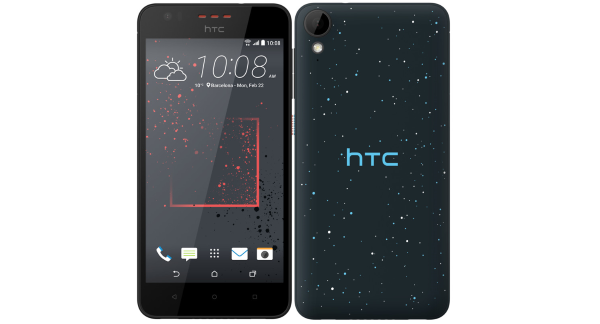 Like other HTC smartphones, the HTC Desire 630 and Desire 825 also features HTC BoomSound speakers with Dolby Audio technology for enhanced sound experience and also comes bundled with Hi-Res audio headset. All the handsets run on latest Android 6.0 Marshmallow out of the box based HTC Sense 7 UI laid on top and will be available in the markets from March 2016. The company has provided no information about the prices of the new Desire series smartphones. The Desire 530 flaunts a 5-inch (1280×720 pixels) HD Super LCD display offering a pixel density of 294 ppi and comes powered by Snapdragon 210 quad-core processor clocked at 1.1GHz coupled with Adreno 304 GPU. The device comes with 1.5GB of RAM, 8GB of onboard storage and also includes a microSD card slot for further expansion. The handset comes backed by a 2200mAh battery that might be enough to take you through the day considering the low-end specifications. On the camera part, the smartphone sports an 8MP autofocus rear camera with BSI sensor, LED flash, f/2.4 aperture and a 5MP front-facing camera for video calling and selfie clicks. The dual sim dual standby supported device comes with standard connectivity options like 4G-LTE, Bluetooth 4.1, GPS, Wi-Fi and microUSB 2.0 port. The dimensions of the smartphone measure 146.9 x 70.9 x 8.3 mm weighs around 140 grams and comes in Graphite Grey and Solid Stratus White color options. The Desire 630 features a similar 5-inch (1280×720 pixels) HD Super LCD display with 294ppi as pixel density and under the hood, it packs slightly powerful Snapdragon 400 quad-core processor clocked at 1.6GHz paired with Adreno 305 GPU and 2GB of RAM. It supports dual sim dual standby and includes similar connectivity options like the Desire 530. It also powers a similar 2200mAh battery that lasts for an entire day on single charge. On the photographic front, the smartphone sports a 13MP primary camera with LED flash, autofocus, BSI sensor, f/2.4 aperture and is also capable of recording 1080p videos at 30fps. On the front, it has a 5MP snapper for crazy selfie lovers. The device comes with 16GB of onboard storage and also includes an externalSD card slot for expansion of memory. Its dimensions measure 146.9 x 70.9 x 8.3 mm weighs around 140 grams and comes in Stratus White Remix with a duo color micro splash and Graphite Gray Remix with Gold Micro splash colors. The HTC Desire 825 is the largest among all the devices as it comes with a 5.5-inch (1280×720 pixels) HD Super LCD display offering a pixel density of 267ppi. The smartphone also packs a larger 2700mAh battery and also features a Sensor Hub, an always-on hub that tracks your regular activities, gestures and dynamic for fitness info. 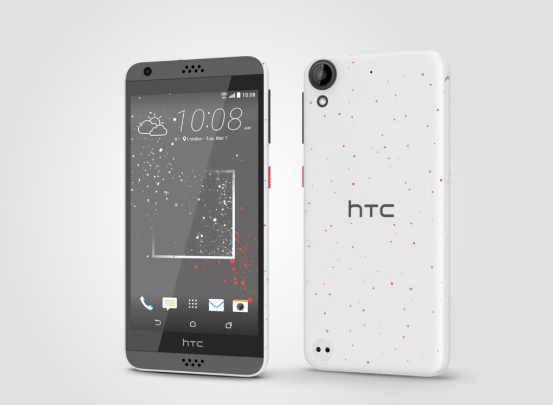 Apart from this, the rest of the specifications are similar to the HTC Desire 630. The dimensions of the smartphone measure 156.9 x 76.9 x 7.4 mm weighs 155 grams and will also be available in Stratus White Remix with a duo color micro splash and Graphite Gray Remix with Gold Micro splash color variants.